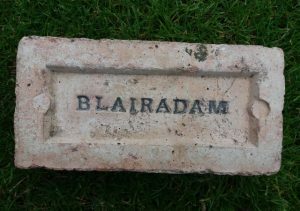 Blairadam has had 2 brickworks sites over the years. 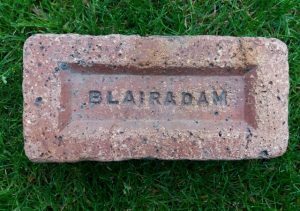 Canmore – Blairadam Brick and Tile Works – Alternative Names Lassodie; Whitehouse Wood;Thornton Wood – Archaeological Notes. – The site of Blairadam Brick and Tile Works (depicted on the 1st edition of the OS 6-inch map (Fife & Kinross, 1856, sheet 30) lies in Whitehouse Wood, a dense forestry plantation. No trace of it was located at the date of visit. NT 1200 9400 (centre) A watching brief was undertaken as part of an Environmental Assessment at the opencast coal site of Blairenbathie. The site of a former 19th-century brick and tile works and two domestic cottages, identified in a previous evaluation (Strachan 1996), were examined, as well as additional structures. A small rectangular building measuring 10 x 5m was identified as a workers’ lobby (rest room). Within the W end of this small room, the remains of an iron grate were found in situ. The foundations of the building comprised waster drainage tiles which show that this building was not a primary component of the brick and tile works. A kiln was situated about 10m W of the workers’ lobby. Its rectangular outer walls measured 12.3 x 8m and were constructed of bonded brick. The kiln chamber floor lay 1.5m below the present ground surface and was found to be heavily disturbed, although ten courses of brick survived on its western side. The positions of the fire boxes (stoking holes where coal was laid) could not be determined. It is considered, from the remains of fragments of brick-arch, that the kiln was a single-chambered rectangular Scottish updraught example with arches over the fire boxes. Rubble was cleared from an L-shaped building situated to the NE of this, perhaps associated with the Blairenbathie Coal Pit (which was abandoned in 1876). The building walls were of bonded brick (stamped HILL OF BEATH) and enclosed the vestigial remains of a tiled floor. A detailed report will be lodged with the NMRS. 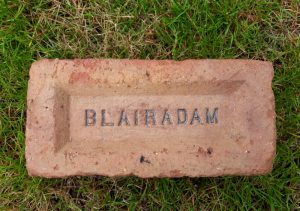 Sponsor: William W Graham (Contractors) Ltd.
Canmore Blairadam Brickworks – Kelty, Fife – Archaeological Notes – Blairadam Brickworks was situated on the W side of Kelty, immediately W of the site of Blairadam Pit No.1. 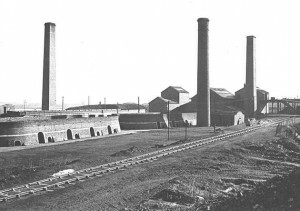 The brickworks consisted of two kilns, one ten chamber round ended Hoffman continuous process and one Newcastle type. In addition, the works had three chimneys, one round and two square. Later, a second round ended Hoffman kiln was added, this being shown on the later OS 25-inch maps.. The brick works are depicted on the Revision edition OS 25-inch (Fifeshire, 1915) and subsequent editions (1938-1943). The works were owned by the Fife Coal Company and operated between 1898 and 1947 when they were taken over by the National Coal Board. The works subsequently taken over in 1969 by the Scottish Brick Company and closed by them in 1977. All buildings were removed by 1979 and the site landscaped..
Blaes from the adjacent Blairadam Pit No.1 was used as raw material. 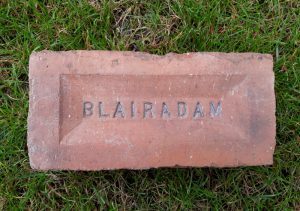 Source – A later entry in the History of the Fife Coal Company states that, in 1902, Blairadam Colliery, with its brickworks and two pits were purchased by the Fife Coal Company. It possible, from this limited information, to suggest that perhaps the Blairadam pits reverted to the care of the Blairadam Coal Company (under James Terris) in either the late 1880s, or early 1890s, until 1902. In an article, written in December 1898, we find references to the Company and the coals worked: “… Operations are going on briskly at Blairadam Colliery. The Company made a very good start some years ago; but as fate would have it, they ran into a stretch of calcined coal with their Dunfermline Splint seam. Happily, the Company were plucky enough to cut through the burnt coal, and for some time they have had before them a considerable stretch of the very finest Dunfermline Splint coal. There is now not the slightest trace of calcined minerals in the faces; and during these prosperous times, the Company has been doing splendidly. The blaes which overlie the seams of coal make a capital fireclay and, in the hope that the utilisation of the blaes might prove a profitable concern for the Company, a Hoffman Kiln was recently erected in the vicinity of the pits and the work of brick-making commenced. The machinery is all of the most approved type, and the output is already as much as 10,000 bricks per day. 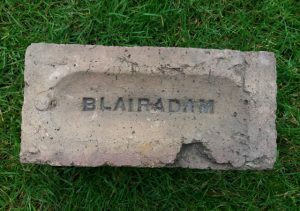 26/01/1854 – Fife Herald – Blair Adam Tile and Brick Work to be let on lease. Entry 1st April next year. For particulars apply to Andrew Douie, Factor of the Estate, with whom offers may be lodged on or before the 1st day of March 25/01/1854. 07/01/1903 – Edinburgh Evening News – Wanted Hoffman Kiln Burner, also panman. 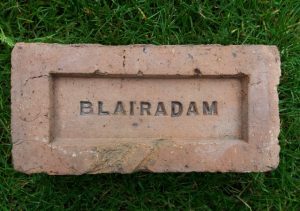 Apply Blairadam Brickwork. 1922 – The Fife Coal Company Limited owned the brickworks at Hill of Beath, Blairadam and Bowhill. 06/09/1934 – Dundee Courier – The Fife Coal Company displayed Fife manufactured bricks at an exhibition at British Industries House, Oxford Street, London. (Notes SBH – There is no reference to which exact brickworks were featured). 11/07/1936 – Dunfermline Press – A dispute at the Fife Coal Company’s Blairadam Brickworks over a question of wages culminated on Wednesday in the employees, numbering sixty in all, deciding on strike action. Although negotiations have been proceeding with a view to a settlement, no agreement had been reached late yesterday afternoon. 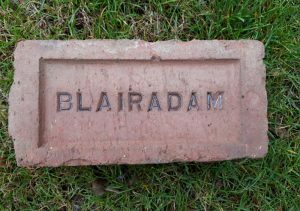 Pre 1941 – Several years ago an uncharted coal mine was discovered at Kelty in the vicinity of the present Blairadam Brickwork. It was found by workmen who were digging for clay for the brickwork at a depth of about 20 feet. They came across a narrow roadway about 3 feet broad and 3 feet high, along which it was quite apparent the coal was carried in the dark, the person carrying the coal being guided by a ledge of coal left for that purpose on the left hand side, so that while he or she (probably a he, if the coal was worked by the monks) carried the coal with his right hand and directed himself with his left. The shaft of that pit, if there was a vertical shaft, was never discovered. In all probability it was only an incline and emerged at the surface and, of course, was filled in during the course of time. 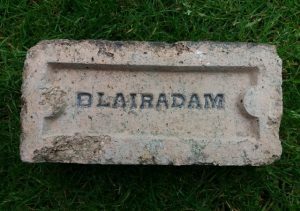 17/01/1959 – Dunfermline Press – An “amenities block,” which is understood to be the first of its kind for brickwork operators in Scotland, was put into use at Blairadam Brickworks in November. The building contains separate shower baths; clean and dirty clothes lockers; dedusting equipment for working clothes and overalls; a fully equipped first-aid room; and separate mess rooms for male and female employees. Found Jedburgh, Scottish Borders. Blairadam Brickworks, Kelty, Fife. . . . .